We’re so excited that you’ve enjoyed reading about the origins of the Cape Cod style. The charming and simplistic architectural style is one of our favorites and specialties. I can almost hear the calming ocean winds in the background when I’m sitting in a classic Cape, even if I’m nowhere close to the water! There’s just something quaint and captivating about sitting in a formal parlor with timber beams above and soft wide plank floors below. And even though you (and I!) may have a home built in the early 2000s, that doesn’t mean we can’t get the same look and charm of the Cape Cod style: it just means we borrow some ideas from our ancestors! The interesting thing is that while many Cape Cod style homes are built with the exterior design in mind, sometimes the interior is either overlooked or does not carry the same New England detail within. The Bees work with trusted craftsman, tradespeople, architects, and builders to ensure the charming details are accurate on the exterior, and we specialize in marrying the interior with their vision. The next few blog posts will not only introduce you to this beloved interior style, but show you how we’ve incorporated these elements into modern day designs. So let’s step through the welcoming wooden front door, shall we? Before we can get into the furniture, the classic color palettes, etc., we need to talk about the big picture. Most notable about the Cape houses is the construction of the house itself and how that impacts the interior. Back in the old days, when the Cape houses were originally built, the main framing members were extremely large hand-hewn timbers (think of those massive trees and how they were being transported?!) The interior walls, being so thin, allowed the corner posts and framing members to be visible, including the ceiling girts and beams. Ceilings were low to help close in the heat from the harsh winters, so the wood beams across the low ceiling created a cozy look. In many of the homes, a large exposed beam ran across the parlor ceiling from the fireplace to the opposite outside wall. Structurally, this beam was to support the framing members above it; visually it created an unintentional focal point that is still prized today. The floorboards in Capes were very wide. (Although, they were never wider than 23” as anything above was earmarked for the British Crown!) In any case, wide-planked pine flooring is an original to old houses such as these. I especially hold a special place in my heart for floors that have just a tinge of a creak underfoot….you know they have some stories to tell! The Bees have always revered the timber beams as a focal point and love adding this detail to create a charming structure from within. Wide-plank flooring creates a nostalgic feel, even if it’s not original. While the project below may be a reproduction-style home, the elements themselves invoke the charm of the age-old Cape. Other aspects are pulled from the New England style (wainscoting, trim, molding, etc.) which will be discussed in the next blog post! Notice the timber beams and wide-plank flooring. Design by Bee’s Knees. The fireplace held a much more important job during the Puritans’ age than it does today. The fireplace was the source of cooking and baking; it was comprised of a brick enclosure to create an oven. In 1755, Benjamin Franklin invented his namesake fireplace, much like the focal fireplaces we have today. The Franklin fireplace was made of cast-iron and bricked in around the old ovens. Mantels were built around the cast-iron insert with wood and other materials, much like the fireplaces we revere today. 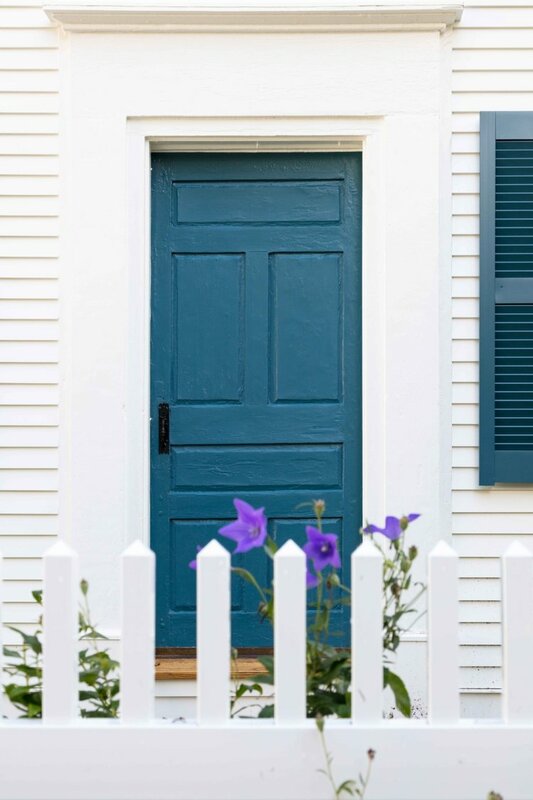 Cape Codders almost always entered their homes through the rear, but they took great care in the details of the front door. Usually these doors were paneled in the shape of a cross, which became known as Christian doors. Originally these doors were simply wood, but in later colonial periods, two panels were replaced with handblown glass. Later, as houses were built higher, smaller panes of glass were added to the top stile of the door. In the Federal period, people were beginning to show off their wealth more, by adding sidelights and a fan-shaped glass or shutter to the top of the door. (Designs below by Bee’s Knees and Blakely Builders). Windows were also precious back in the early days. The glass was hand-blown with wavy surfaces and occasional bubbles. The window lights (or mullions as we refer to them now) were most common with 9x6, 12x8, or 12x12 patterns. In the image below, the windows were 3x4. Inner shutters (known as Indian shutters) recessed into the walls behind windows. Though the original intent of these shutters were for protection from the Native Americans during this time period, it was scarcely needed in the Cape region. But instead these shutters were used purely for protection from the elements. Now that we’ve discussed the structural components of the Capes, we’re going to be taking a closer look at the details (trim, wainscoting, etc.). Next week, get excited for Part II! Now it’s your turn - what’s your favorite interior detail of the Cape Cod look? Tell us below! And if you missed any of our other Cape feature articles, you can see them here.